Clean Drinking Water Edmonton | FAQ | Distiller Warehouse Ltd. Welcome to the Distiller Warehouse Ltd. FAQ page. Hopefully we can answer many of your questions, and we appreciate your feedback – whether about our business or our website. Please email us any questions you may have about water purification equipment. How do I clean my water distiller? What do I need to know about filter changes? How do I find out the prices of the water distillers? What is the warranty information? Which water distiller is the best? How do I choose a water treatment system? How much does it cost to operate and maintain a water distiller? Do you offer a money-back guarantee on your products? Due to the differences in water supplies, you will find that you may have to clean your distiller more often, or not as often. We recommend regular cleaning, as it eliminates wear and tear on the water distiller; thereby prolonging its life. Sulfamic acid is a good descaler. Some people prefer to use vinegar, a milder acid, to clean their distillers. Follow the same procedure. Descale your distiller every 3 to 4 months and drain the boiling chamber every week. Turn off the main power switch. Remove the lid from the boiling chamber. Add 5- 6 tablespoons to boiling water in your boiling tank. The amount will depend on how dirty your boiling tank is. Let soak for 4 hours, or overnight if you wish. Next day, drain descaler from boiling chamber and rinse by pouring 4 litres or more of water into the boiling chamber. Drain once again until all the descaler residue has been removed. If scale is still present, try wiping the residue from the sides with a soft cloth. If still present, repeat steps 3 and 4. Turn on main power, water and fan switches and ensure water is coming into the boiling chamber. Replace lid on boiling chamber. Distiller is now ready for operation. Many water distillers come with an activated coconut charcoal filter. This gives the distilled water a ‘clean’ taste. We recommend that you change the activated coconut charcoal every 1 to 3 months. Empty old charcoal from stainless steel canister. Fill canister 2/3 full of new charcoal. Rinse the new charcoal with 2 kettles of boiling distilled water and then 2 cups of cool distilled water to cool the canister so you can handle it. Note: Our Precision Water Distillers Models PWS 8-5, 8-8, 12-12, 12-20, have the optional sealed cartridge carbon filter that only needs replacing once a year. As an Authorized Sales and Service Centre for Precision Water Distillers and Polar Bear Water Distillers, we are currently working on publishing pricing policies for the Internet. Due to the widespread deviation from Manufacturer's Suggested Retail Pricing by un-authorized dealers in the marketplace, we may undergo a published pricing ban. If you cannot find the pricing you need, contact us! We prefer to talk with you directly regarding pricing so that we know that all your questions about our product are properly answered. You can see all the specifications of all our water distillers on this website. If you would like pricing and additional information on any of our water distillers just send us an email stating the specific distiller on which you would like pricing. If you would be interested in receiving our standard information package about all the water distillers, just send us your mailing address. If you would like to see a specific brochure immediately, we can fax it to you if you send us your fax number. We will do our best to answer your request within the week. For immediate answers, please feel free to phone us. The warranty on the Precision Water Distillers is 2 years complete, and 15 years pro-rated on stainless steel. The warranty on our reconditioned distillers is 6 months complete. The warranty is invalid if damage is caused by accident, Act of God, customer abuse, freight damages, unauthorized alteration or repair, vandalism or misuse. As an authorized sales and service centre for the main water distiller brands, we are required to stock a full inventory of replacement parts and accessories. All warranty issues are dealt with immediately through our store. It is important to do your research when making an investment into any water purification system. There are many makes and models of water distillers on the market today. We recommended that you look for a water distiller with consumer certifications such as NSF, UL, CSA and WQA. Ask your local representative if there is an independent lab test to verify the efficiency of the water distiller. Compare prices, features, warranties, maintenance costs, availability of parts and service, and expected life of the water distiller. The most IMPORTANT thing to do is to make sure that the company you are dealing with is an authorized sales and service centre for that water distiller. 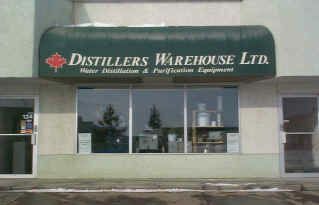 Only an authorized sales and service centre can offer warranty work and proper parts for your distiller. Ask for the manufacturer's phone number, as they can provide you with a list of the authorized centres for your region. BEWARE: a non-authorized company is not permitted to handle the water distiller, parts, warranty, etc., and if they ever close, your warranty will not be honoured by the manufacturer. If you have questions about this or need any manufacturer's phone numbers, please let us know. Available water treatment systems include distillation, reverse osmosis, carbon filters, ultraviolet lights, etc. All water is different, ranging from well water to municipal water supply. If you are on well water we may ask for an analysis, if you have one, so we are as informed as possible about your situation. There may be high iron content causing staining of fixtures, clothing, etc., or H2S causing smelly water in the home or hardness concerns. Hardness is a concern of many municipal water supplies, as well. Water distillers provide the purest form of drinking water available. Distillation is the only process that removes more than 99% of contaminants, chemicals, impurities, and pollutants. Distillation produces steam, which is the only way to kill and eliminate bacteria and viruses by leaving them behind in the boiling chamber. No other water treatment process is as effective or reliable. Distillation does not rely on physical barriers that can break down or fail. The operation of a water distiller is not affected by changes in the water supply, such as low or varying pressures, temperatures, or PH levels. Water distillers produce very little waste water and are energy-efficient, consistently producing high-quality, pure water. They are extremely durable, trouble-free appliances that require a minimum of service and maintenance for many years of efficient and effective operation. If you have further questions about water purification or if you would like information sent in the mail, please contact us. Shipping costs will vary, depending on where you live and the product ordered. We can quote the shipping rate to your area by request. Once you have decided to make your purchase, we will process your Visa, Master Card or money order. Our toll-free phone number for orders is 1-888-437-0311. Each water distiller comes with a complete instruction manual. It will explain everything you need to know about the operation and care of your distiller. If you ever have any questions that are not answered by the instruction manual, we can always be reached by email or by phone. We are always happy to answer any of your questions. We have a standard information package that we can send to you in the mail if you provide your mailing address. We can answer specific questions by phone or by email. Just let us know how we can help you with your research. On average, it will cost you about 25 cents for electricity per Gallon of distilled water made. Proper cleaning and maintenance should be done on average 3 to 4 times per year and costs about $20.00 Canadian for the year's supply of charcoal and descaler. We have a 30-day money-back guarantee, less a 20% restocking fee, and less shipping charges both directions. A return authorization number must be given for all returns so that all the shipping paperwork is handled correctly.